Mamani M, Majzoobi MM, Ghahfarokhi SM, Asna-Ashari F, Keramat F. Assessment of Health-related Quality of Life among Patients with Tuberculosis in Hamadan, Western Iran. Oman Med J 2014 Mar; 29(2):102-105. In addition, just the diagnosis of TB alone may lead to depression and anxiety or contribute to the worsening and persistence of disease symptoms, which follows with fear, frustration, and disappointment.8 Furthermore, most TB patients have no knowledge of disease progress and treatment which can cause more anxiety and feelings of frustration and decreases the QOL among the patients.9 Studies focusing on the QOL among TB patients are limited and no such investigation has been conducted among the Iranian population. Considering the fact that improvement in health-related QOL is an important factor for better response to treatment among TB patients, which may lead to better outcome in patients’ mental health, infection surveillance and prevention programs as well as location of Iran. On the other hand, as an endemic country for TB and no previous study on QOL of TB patients has been conducted in Iran, this study was designed to assess the QOL among TB patients living in Hamadan, a TB-endemic province, Western Iran, and compare the findings with the QOL among a healthy population taken as controls from the same area. A cross sectional analytical study was conducted in Hamadan, Westrn Iran between December 2009 and March 2011. The study protocol was approved by the Research Ethics Committee of Hamadan University of Medical Sciences. All participants signed an informed consent before entering into the study. Since the total number of patients who entered into the Provincial TB Clinic in Hamadan city during the research period were almost similar to the sample size; therefore, the first 64 patients attending the TB clinic were selected in that period if they fulfilled the inclusion criteria. For selection of the control group, 120 random numbers were chosen and were assigned to people who consecutively entered into the Blood Transfusion Organization clinic. The QOL measures were administered by trained investigators to the participants. TB patients completed these measures at the baseline, two months, and six months during their regular scheduled visits. Data for the study were collected by in-person interviews which were done by trained interviewers. All participants were interviewed face-to-face in completing the study QOL measures. Before study enrolment, all individuals were informed about the voluntary nature of participation and confidentiality as well as the use of their data for research purposes only. Also, the confidentiality of the participants’ data was ensured by the lack of any identifying personal information. A two-part questionnaire including demographic data for the first part and the QOL questionnaire for the second part were designed. All TB patients answered the additional questions about their disease in the first part which included clinical type of TB (with pulmonary [smear positive and negative] and extra pulmonary tuberculosis diseases according to the WHO definitions for TB),2 and the course of treatment (baseline, two months, and at the end of treatment). The second part consisted of 36 items short form SF-36 questionnaire to determine health-related quality of life. The validity and reliability of the SF-36 questionnaire has previously been studied.10 The SF-36 questionnaire has been previously translated, validated, and standardized for the Iranian people (Persian version) by Montazeri et al.11 This questionnaire contains eight categories assessing diverse concepts of health including physical functioning, physical role, bodily pain, general health, energy, social functioning, and emotional domain and mental health. In addition, certain domains can be aggregated to create the total QOL measures. For all the SF-36 categories and summary scores, higher scores indicate better health. All statistical analyses were done using SPSS, version 16 (SPSS, Chicago, Illinois). To compare variables, Chi-square and one-way ANOVA tests were used. Moreover, Pearson correlation was used to determine the association between continuous quantitative variables, and also the Spearman correlation was used to assess the relation between QOL scores and ordinal variables. Repeated measure analysis was done for comparing QOL of TB patients at different time points. Finally, linear regression analysis was used for adjustment of some confounding variables. All hypotheses tests were 2-tailed with p<0.05 considered as significant. Data are presented as mean ± standard deviation (SD) for quantitative variables and frequency and percentages for qualitative variables. In this study, 64 cases with TB and 120 healthy controls were enrolled. The mean age was 55 ± 20 and 41 ± 16 years in the cases and controls, respectively. Totally, 37 cases (58%) and 46 controls (38%) were female. 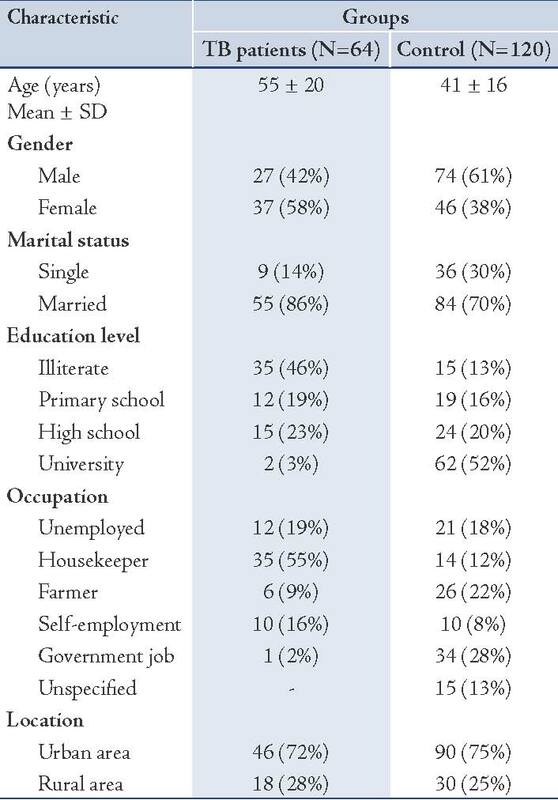 Table 1 shows the demographic characteristics data between the two groups. In the case group, 46 patients (72%) had pulmonary and 18 (28%) had extra-pulmonary TB. There were 31 (48%) smear positive pulmonary TB among the case group. Table 1: Demographic characteristics of the patients with TB and control group. 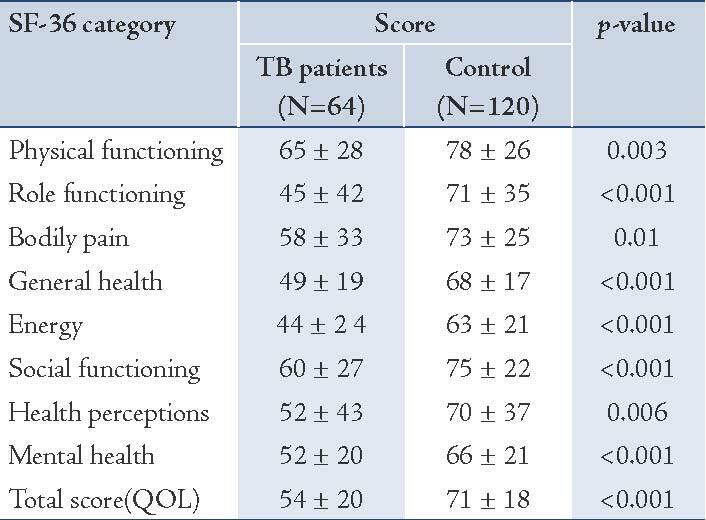 Table 2: Comparison of eight SF-36 category scores between the TB patients and the control group. The QOL of TB patients was assessed at two-months as well as at six-months after treatment with four-drug TB regimens. Overall, QOL score was 59 ± 18 and 63 ± 19 at two and six months after anti-tuberculosis treatment, respectively. The "Repeated Measure" test was used for inter-groups data at different time-points (0, 2, and 6 months after onset of treatment). This test indicated that the QOL of TB patients was significantly improved at two months after treatment (p=0.01). However, there was no statistical difference between the second and sixth months of TB treatment (p=0.07). On the other hand, six-months treatment with potentially toxic agents may lead to anti-TB related side effects such as isoniazid-induced liver dysfunction or leukopenia due to rifampicin which may cause the QOL impairment. Wang et al. showed that the QOL of pulmonary TB patients decreased when compared to the general population and its associated factors included focus size of infection, counts of white blood cells, complications, elevated ALT and the duration of disease.15 Therefore, a better QOL in TB patients can be achieved with proper information about the disease, route and condition of its transmission as well as periodical laboratory evaluations and repeated examinations over the treatment course to perform appropriate actions after drug complications. There are some limitations in the present study that may have some potential impacts on the results. All prognostic features such as co-morbidities were not included in the analysis. In addition, for comparing of QOL between two groups, it would have been better to conduct a pure analytical study; however, this study (comparative cross sectional study design) is also useful for analysis of this comparison. The study yeilded low QOL scores among TB patients, in spite of new therapeutic and surveillance strategies, and it is concluded therefore, that more attention should be focused on QOL improvement in order to improve response to the treatment and decrease the rate of drug failures as well as improvement of mental and physical functioning among TB patients. The authors would like to thank Dr. Tahereh Doroozi, the staff at Health Center of Hamadan and Iranian Blood Transfusion Organization in Hamadan for their contributions in this research. No conflict of interest to be declared. 1. Marra CA, Marra F, Colley L, Moadebi S, Elwood RK, Fitzgerald JM. Health-related quality of life trajectories among adults with tuberculosis: differences between latent and active infection. Chest 2008 Feb;133(2):396-403. 3. Lienhardt C, Espinal M, Pai M, Maher D, Raviglione MC. What research is needed to stop TB? Introducing the TB Research Movement. PLoS Med 2011 Nov;8(11):e1001135. 4. Dion MJ, Tousignant P, Bourbeau J, Menzies D, Schwartzman K. Feasibility and reliability of health-related quality of life measurements among tuberculosis patients. Qual Life Res 2004 Apr;13(3):653-665. 5. Guo N, Marra F, Marra CA. Measuring health-related quality of life in tuberculosis: a systematic review. Health Qual Life Outcomes 2009;7:14. 6. Kaplan RM, Ries AL. Quality of life: concept and definition. COPD 2007 Sep;4(3):263-271. 7. Chamla D. The assessment of patients’ health-related quality of life during tuberculosis treatment in Wuhan, China. Int J Tuberc Lung Dis 2004 Sep;8(9):1100-1106. 8. Peterson Tulsky J, Castle White M, Young JA, Meakin R, Moss AR. Street talk: knowledge and attitudes about tuberculosis and tuberculosis control among homeless adults. Int J Tuberc Lung Dis 1999 Jun;3(6):528-533. 9. Salomon N, Perlman DC, Friedmann P, Perkins MP, Ziluck V, Jarlais DC, et al. Knowledge of tuberculosis among drug users. Relationship to return rates for tuberculosis screening at a syringe exchange. J Subst Abuse Treat 1999 Apr;16(3):229-235. 10. Dion MJ, Tousignant P, Bourbeau J, Menzies D, Schwartzman K. Feasibility and reliability of health-related quality of life measurements among tuberculosis patients. Qual Life Res 2004 Apr;13(3):653-665. 11. Montazeri A, Goshtasebi A, Vahdaninia M, Gandek B. The Short Form Health Survey (SF-36): translation and validation study of the Iranian version. Qual Life Res 2005 Apr;14(3):875-882. 12. Duyan V, Kurt B, Aktas Z, Duyan GC, Kulkul DO. Relationship between quality of life and characteristics of patients hospitalised with tuberculosis. Int J Tuberc Lung Dis 2005 Dec;9(12):1361-1366. 13. Unalan D, Soyuer F, Ceyhan O, Basturk M, Ozturk A. Is the quality of life different in patients with active and inactive tuberculosis? Indian J Tuberc 2008 Jul;55(3):127-137. 14. Anwar Sulehri M, Ahmad Dogar I, Sohail H, Mehdi Z, Azam M, Niaz O, et al. Prevalence of depression among tuberculosis patients. Annals of Punjab Medical College. 2010;4:133-137. 15. Wang Y, Lii J, Lu F. [ Measuring and assessing the quality of life of patients with pulmonary tuberculosis]. Zhonghua Jie He He Hu Xi Za Zhi 1998 Dec;21(12):720-723.